Damascus (AINA) -- Everyone has heard of the Kurds, Shi'a and Sunni Muslims but few people are aware that Iraq has the oldest surviving Christian population in the world. In fact Assyrians still speak Aramaic, the language that Jesus spoke. The consequence of war has forced many to flee to Syria and other Middle East countries for safety. I was in Damascus at the beginning of May undertaking a short visit for the UK Assyrian Aid Society. I cannot forget the images that I saw, the voices I heard -- the tears and the laughter, the eagerness of those who shared with me their traumatic experiences and the silence of those, who out of sheer grief couldn't share anything at all. I enjoyed the company of the Assyrian folks I met -- I could relate to them as their Christian culture is not too dissimilar to mine. The Assyrian Aid Society staff in Damascus, Syria, who are themselves displaced people, help their fellow Iraqis of all religions to get hospital treatment and operations. The Syrian government is to be commended for accepting large numbers of displaced people - a fact not appreciated by western governments. Nada, an Assyrian Christian, lived only a short walk from the AA Society office. She made some tea for us, and through Rita my interpreter began to talk affectionately about her husband as she looked at his photograph on the wall. She suddenly went out of the room and came back clutching her husband's company ID badge that had a hole in it -- a hole made by the bullet that killed him. What can you say when someone thrusts such a card in your hand? I was lost for words and couldn't say anything -- I just stared at the photo. Nada had a large scar on her neck showing the results of a thyroid operation. Her daughter is called Alice -- the same name as my deceased aunt -- such name associations can tug at your heart! Assyrian parents often have mixed English and Assyrian names for their children. 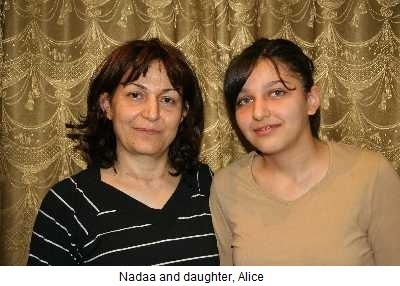 Alice was a sixteen year old young woman that had seen better times in Iraq as little girl. 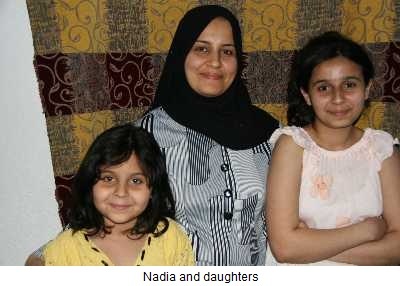 Nada was a veterinary surgeon and her husband was an electrical engineer in Iraq. Their good life was shattered by the death of her husband and turned into an even greater nightmare when Nada and Alice had to quickly flee Iraq because their lives were threatened. There was no alternative but to head for the comparative safety of Syria. 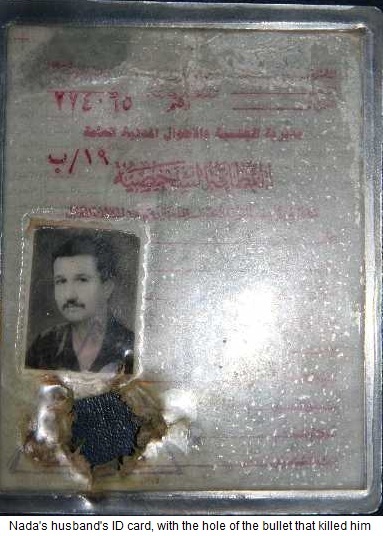 I took the photo of the ID card on Nada's very large Arabic study Bible. I saw how the Assyrian Aid Society and the Medical Aid staff showed love and care to all Iraqis whether Christian or Muslim. 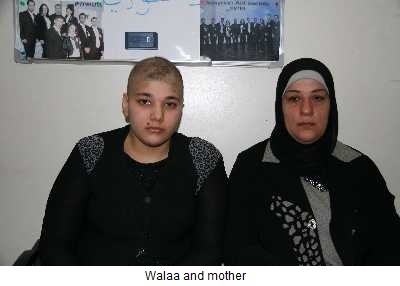 Walaa, a Muslim girl in her mid teens, had lost all her hair a few days after the trauma of seeing her father shot and killed right in front of her. Walaa, who spoke good English, was with Nadia, her mother in the AA office and I was with Sargina and Rita, two Assyrian women who work for the society. Walaa insisted she should take off her scarf to show us her head -- everyone in the office wept. Walaa is desperate to get something done about her illness. I counted at least twenty prescriptions with multiple medications on each. She couldn't sleep, loses her balance when she walks and appeared to have a glandular problem on her neck behind her ear. It seemed that no doctor is able to diagnose her illness. They both had to flee Iraq as they were the 'wrong' kind of Muslim in the area they lived. Assyrian staff and other Assyrians who had come into the office for a chat and cup of tea stared at the TV in silent revulsion on Sunday morning. Ashur TV, the Assyrian channel, was showing a report about some madmen who had bombed two student buses near Mosul in Iraq (AINA 5-5-2010); the buses were full of Assyrian students. The report had camera work that all too vividly showed the horror of blood spattered students lying in hospital corridors. It is the type of filming that would not be allowed by British TV authorities. The nine or so Assyrians in the room were visibly distraught -- one said to me 'you see what is happening to us'. A young man with blood all over his face was being interviewed and shouting out, I thought he was speaking angrily about the bombers, but one of the guys in the room translated; he was saying to the bombers, 'we are not like you, we are Christians and we forgive you.' Ninos, sitting next to me knew someone who was injured and Pawel in the next office had a relative injured. In the context of all this killing it is important to note that the Assyrian Aid Society helps all Iraqis of all religions. A further short walk led us to another house where I saw a little two year old girl, Rawan Ahman from Mosul who had two pins in her leg to help straighten it out. The operation was a success and the Muslim parents were, as you would imagine, overjoyed. 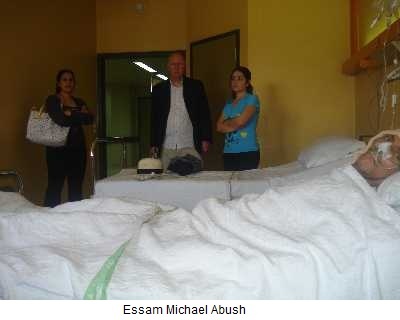 We visited Essam Michael Abush in hospital, an Assyrian Christian with a number of brain tumours; he'd been in hospital for nearly three months -- the likelihood is that he will not last very long. Dr Asaad Foaz was good enough to talk with me and explain that because there were several tumours, an operation would probably be fatal. He was hoping that drugs would reduce the size the tumours enough to operate. 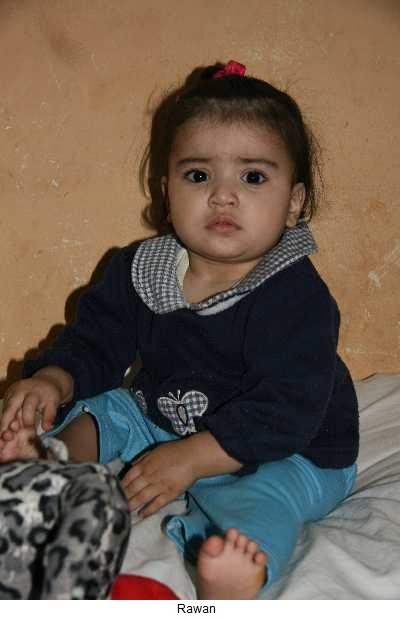 Essam's wife cares for him day and night while relatives look after their two daughters. A Catholic church called Ibrahim Al Khalil (means Abraham the Friend in Arabic) in Damascus operates as a convent, church and hotel (where I stayed). Maria, a Canadian, from Montreal, witnessed the nuns providing refugee families with free food every day at 1:00. Iraqi families come every second day to receive food. Maria was moved by the nuns care as she saw Iraqis come with empty pots and leave with them full of food. Some were elderly people coming alone; some came with their children to help carry the pots. She said it's very touching to see the sheer poverty of their lives as they wait for their next meal. 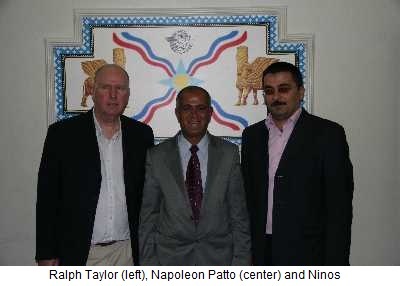 It was a privilege to meet Mr Napoleon Patto, the overall head of the Assyrian Aid organisation. He was a political prisoner for 11 years in the regime of Saddam Hussein. His main objective is to keep Assyrian Christians in Iraq. Mr Patto has the immense task of organising medical supplies, schools and all aspects of village infrastructure that enable Assyrians to live as normal lives as possible. He has discussed security and aid issues with American generals and Iraqi politicians and accompanied three British politicians on a tour of Assyrian areas in Iraq. The AA Society in Iraq, like its counterpart in Syria, helps people of all religions and not just Assyrian Christians. Mr Patto is clear that only the cessation of murders and intimidation by groups seeking their own aims, along with a political solution, will guarantee the human rights of Assyrian Christians. Only then will the flood of Assyrian displaced people, using countries like Syria as a kind of 'halfway house', cease. The indeterminate state in which Assyrians live in Syria is heart wrenching to see; they wait several years for their UN 'ticket to freedom' to arrive, enabling them to go to the new lands of the West, far away from the nightmare land they once called home. Mr Emmanuel Kelaita, the President of the UK Assyrian Aid Society and his wife Val were brought up in Iraq and having lived for many years in the UK and are both British citizens. As well as English they speak Aramaic, as well as Arabic (see pictures and reports of them at www.assyrianaid.co.uk). 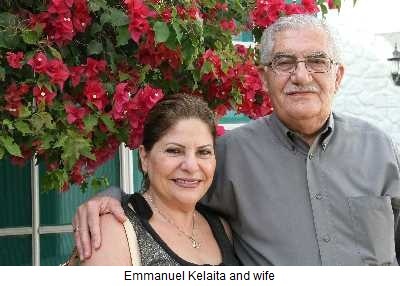 Mr Kelaita owns a printing company in Ajman near Dubai in the UAE and personally finances the work of the UK Assyrian Aid Society in Damascus by paying for about eight office staff and the running of the office. I spent several days with Mr Kelaita discussing the plight of the Assyrian people. It was moving to listen to a man, who for years has unwaveringly supported his people at great cost to himself. The Assyrian cause needs many more people like him, people who don't merely talk but show their dedication through actions. He regularly visits Assyrians in Iraq and other countries that have Assyrian refugees. It is hard to appreciate the vast number of refugees; in Syria there are about 1.4 million internationally displaced people (IDP's) from Iraq comprising of Sunni and Shi'a Muslims and Assyrian Christians as well as other minorities. The number of Assyrians in Syria is thought to be well over 300,000 people but the exact figure is uncertain as some are not registered with the UN; the number of Iraqi refugees in Jordan, Turkey, Lebanon and Iran is also unclear for the same reason. In Iraq, during the regime of Saddam Hussein, and indeed during most of Assyrian history, any national census didn't have a tick box for 'Assyrian Christian'. Assyrians had to state that they were either Arab or Kurd; even though they had been in Iraq as an ethnic group longer than anyone else, they officially didn't exist! Although Assyrians now have some rights in law, it is very much theoretical; in practice the law does not protect them and the situation remains very much the same now as it always has, except now with the addition of a slow and protracted kind of ethnic cleansing. Only 10 to 15 years ago there were about 1.5 million Assyrian Christians in Iraq -- now there is less than half that number as a result of an organised endeavour to eradicate them. Most Iraqis are in Syria because they have been threatened -- some at gunpoint. Edward, who, like other Assyrians in Damascus goes to the AAS office to meet up with friends, told me he had seen six people killed and he himself had a gun put to his head and told that if he didn't leave, he and his family would die. Edward like most Assyrians wants to go to where there are substantial Assyrian communities such as the USA, Canada, Australia and New Zealand. Fewer numbers come to the UK; in London it is thought there are around 10,000 Assyrians. Why should we support the Assyrian people? The Nineveh Plain in Iraq is one of the few places in the Middle East with a sizeable Christian community; a community that is the oldest surviving Christian population in the world. If the exodus of Iraqi Christians continues at the present rate there will be no Assyrians left in Iraq in a generation; this culture that traces it's ancestry for thousands of years will become extinct. At one time, The Church of the East was the world's greatest Christian church, spreading from the Mediterranean to India and parts of China. Realistically, the knowledge of Assyrian language and culture will soon become a topic of historical study. After all it won't take long for Assyrians in the USA, Australia, Canada, New Zealand and Britain to assimilate and become American, Australian, Canadian and British -- their Aramaic language and culture will disappear. The sceptic and cynic, however, might think this no bad thing and point to the wonderful stone fragments in the British Museum as adequate reminders of an ancient civilisation. But I for one would rather know that Assyrian Christians are alive and well and living in peace in the land they call home on Nineveh Plains in Iraq.